The perfect driveway is not just practical; it provides your front yard and home with an ideal complementary touch. Here at Blooms Landcare, we know you don’t want the beauty of your house and lawn to be interrupted by a plain, boring driveway. With our professional driveway installation services, you can say goodbye to dreary driveways and hello to a fresh new look! Here are some of the various driveway options you can choose from when you choose Blooms Landcare. Tasteful and environmentally-friendly, pavers are a wonderful pick for your new driveway. 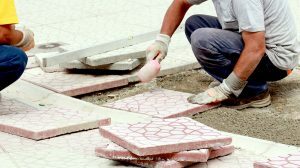 They require regular maintenance to keep debris out of the cracks, but a little bit of cleaning is a small price to pay for the sustainability pavers provide. As water is allowed to seep through the cracks between the pavers (which can be made out of brick, stone, or concrete), it then can drain into the ground instead of running into the street and becoming polluted or contaminated. To learn more about our driveway services and how we can help with installation, repairs, and maintenance, call Blooms Landcare at (817) 688-5352.